The county town, in the very heart of England, has history screaming from every pore and a rich heritage, characterised by its medieval churches. Situated on the River Nene, the town prospered with the building of the Grand Union Canal and the arrival of the railway. The principal industry was boot and shoe making and leathercraft and, to this day, quality Northampton footwear is known the world over. 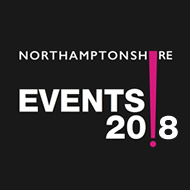 Northampton is one of the greenest towns in the country, with beautiful parkland, and enjoys a thriving cultural scene centred upon the Royal & Derngate theatre and the Errol Flynn filmhouse. The National Lift Tower dominates the skyline and Northampton, home to some big names in motorsport, is the only town in the country to boast top-flight rugby, football and cricket teams.